Guam has decided to send Athena Éva McNinch to Miss International 2019, replacing Kirsten Lydia as the latter is overage for the competition. Athena was Miss Universe Guam 2018. She is 21 years of age, and is currently a masters student after graduating from college. 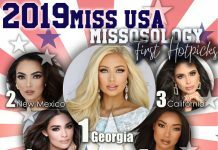 Guam, an unincorporated and organized territory of the United States, had been quite consistent in sending delegates at Miss International pageant. However, the only placement that it had in the pageant was back in 1967 when Margaret Frances Glover made it to the Top 15. The pageant was was held in Long Beach, California and Mirta Massa of Argentina won the crown.